Over 30 silent auction ideas to help get you and your procurement team started. If you end up with more than 40 auction items, it would be good to divide them into two silent auctions and possibly three if you have more than 70. This way people can concentrate on bidding up one section at a time and don't miss out on the opportunity to do a final bid on their favorites. Of course, all silent auction items should have a "guaranteed bid" amount listed on the bid sheet so that bidders have the option to jump to that set price and win the item. New Baby basket. Swaddling blankets, handmade toys, pacifier, diaper cream, baby shampoo, onesies, all in a baby tub. Deck the Halls Christmas basket. Tinsel, garlands, candy cakes, fruitcake, Christmas-themed cookie cutters, Advent calendar, Hickory Farms style edibles, wrapping paper and ribbon. Pirates of the Caribbean basket. Bag of Pirate Booty, chocolate gold coins, a model ship kit, and a DVD of the movie. Baker's Dozen. Baking mixes for cakes, brownies, pancakes, pie crust, pie fillings, rolling pin, glass pie pan. Beach Blanket Bingo. Colorful towels, plastic pail, shovels, beach ball, umbrella, cooler, frisbee, radio, sun block, and funky sunglasses. Rainy Day Survival. Puzzles, board games, deck of cards, Mad Libs, popcorn, ingredients to make smores, classic books and movies. Gardening basket. Garden gloves, shovel, seeds, spray can, fertiziler, soaker hose, sprinkler. Camping basket. Flashlights, tent, compass, local area hiking guide, lantern, cook stove, outdoor cooking pot and utensils, cantern, camping foods, and gift certificate for outdoor recreation store for sleeping bags. Julie and Julia basket. High end cooking dishes, Julie Child cookbooks and DVDs of her show, the book and movie Julie and Julia, and a French cooking class for the winning bidder and friends. Emergency Readiness Kit. First-aid kit, bottled water, transitor radio with batteries, flashlight, matches, lightweight blanket, dried or freeze-dried food. Ultimate Fan basket. Team jersey, team hat, tickets, peanuts, Cracker Jack, binoculars, heat pads, banner, team flag for car. Learn to Knit basket. Knitting needles, yarn, pattern books, knitting magazine subscription, completed scarf, knitting class for winning bidder and friends with local knitting guru. Cards. Handmade thank you or holiday cards. Baby clothes. Any knitters in the community? Hats, sweaters, or booties can be popular in pink, blue or unisex pastels. Pottery. Cups, bowls, tea sets, painted vases. Skip the ashtrays. Hats. Croqueted or knitted winter hats. Caps made with recycled wool can be popular. Purses. Cutches or larger everyday bags. Details like zippers, pockets, and decorative styling add to the value. Shopping bags. Grocery bags are gaining popularity to cut down on paper or plastic bags. Handmade bags should be made from lightweight, durable, waterproof materials. Quilts. 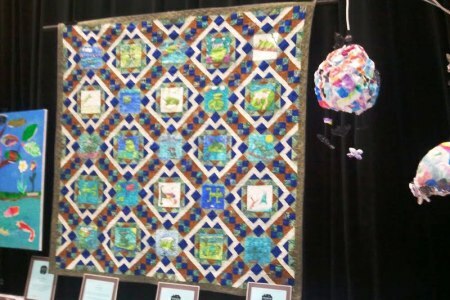 Handmade quilts can take tens of hours to create. Larger ones should be included as live auction items. Wonderful if these can tie into the mission of the organization or theme. Massages. Name one person who would not benefit from a massage right now. Be sure to list the location and neighborhood if not in the same local as the charity. Chiropractic. Any chiropractic businesses in the area? With people spending more time on computers and smartphones, our backs postures are suffering. A great reminder to take care of your health and hopefully get new business for your local chiropractor. Spa Day. Manicure, pedicure, facial, wax, massage - all wonderfully delicious experiences and wonderful treats. Restaurants. Any in the neighborhood of the organization looking to promote their businesses? Could be paired with a theater ticket and babysitting to make a nice school auction item. Museums. Family oriented museums like Children's Museums or Science Centers may be willing to donate tickets to related organizations. Any other museums in your area? Upscale art or kitsch is fun too. Theater. A fun date night out! Be sure to list if it is for a specific show, date and seat, or possible shows before the expiration. Bakery. The smell of fresh baked bread or cookies enticing your noses. Hopefully there'd be a little sampling of the goodies at the end! Brewery. Mmmm beer. Beer can bring out the Homer Simpson in many of us. Fun to compare different styles, smells, and tastes. Be sure to have a designated driver. Winery. Any local wineries in the area? Fun to learn about crush or bottling with hands on experience. Tastings are essential to the process. Historic District. Learn about your city or town through its oldest buildings or neighborhoods. Halloween Haunted Tour. Ghosts from the past can make for a ghoulishly fun experience.